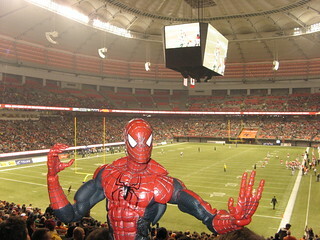 Saw the BC Lions win a few weeks ago. Added it to the album. I also made a new album of all the pictures I took of Spider-Man in Constanta and London!!!! WHAT?! SOMETHING NEW AND EXCITING?! Yes, 132 new things to be exact. The original album only had 101 pictures so I more than doubled that. I placed links to the albums in a new "Spider-Man Pics & Poses" page (see the menu tab at the top of the page) as well as brought back an old page that I made in 2004 explaining the origins of my doll and why I have no friends in real life. Check it out here! PEW PEW! Gas was 119.9¢/litre and 128.9 on November 14. Has been around the low 120s since.